We’ve selected two email marketing solutions – SendinBlue and MailChimp – both of which have a rich feature set, high deliverability rates, and strong user bases. In this post, we’ll evaluate both solutions and help you decide which one’s right for you. We’ll start out by covering a brief introduction of both email marketing services and then move on to their in-depth comparison. SendinBlue was launched back in 2012 with the goal to become the most cost-effective marketing platform. On a daily basis, it delivers more than 30 million emails and text messages. As of this writing, SendinBlue offers services to over 50,000 companies across the globe. Its competitive rates and rich feature set makes SendinBlue a popular choice for growing businesses looking to test out the email marketing waters. Email designer allows you to create stunning campaigns with ease. Flawless integration with platforms like PrestaShop, WordPress, Magento and Drupal. Detailed reports to keep track of the marketing campaigns in real time. MailChimp has been around since 2001 and, back in 2009, announced that it was going freemium. Since then, its customer base skyrocketed from 85,000 to a staggering 450,000 users in one year. The company caters to over 14 million people around the world and is one of the leading email marketing providers in existence. 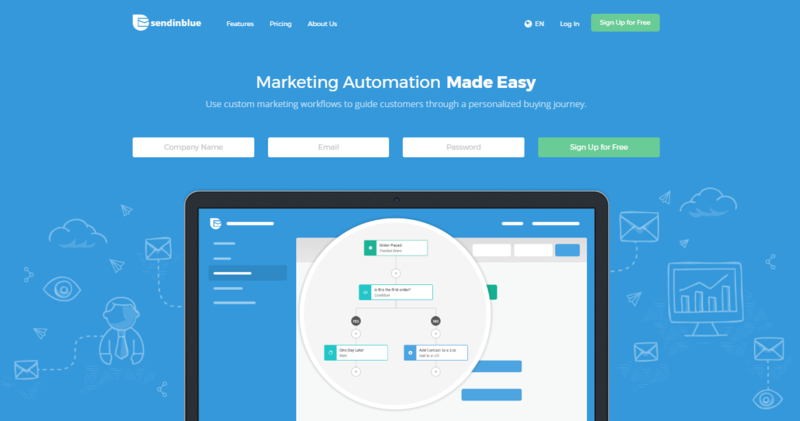 Allows you to create marketing campaigns using a drag and drop builder. Hassle-free, pre-built segments allow you to send targeted mails. Integrates with tons of third-party services such as WooCommerce, Shopify, and Facebook. Tracking performance is a breeze with interactive graphs, subscriber activity reports, and revenue reports. Now that we’ve introduced both services and highlighted the features that SendinBlue and MailChimp have to offer, let’s start digging a little deeper to evaluate the option that’s right for you. What Should I Look for in an Email Marketing Solution? Between SendinBlue and MailChimp, choosing the email marketing solution that’s right for you can be incredibly difficult. This is especially true if you’ve recently launched your website and are looking for a solution that will scale as your business grows. Cost. How much do the email marketing providers charge for their services? And what are their rates based on (e.g. number of emails, size of your list, etc.)? Ease of Use. This gives you insight about the learning curve associated with the platform. Is it easy to learn, or would you have to spend some time going through tutorials? Features and Functionality. What sets SendinBlue and MailChimp apart in terms of functionality? And do both platforms have everything you would need to get started with email marketing? Customer Support. What kind of customer support channels do the email marketing platforms offer? Now that we’ve defined our criteria, let’s explore what each has to offer. 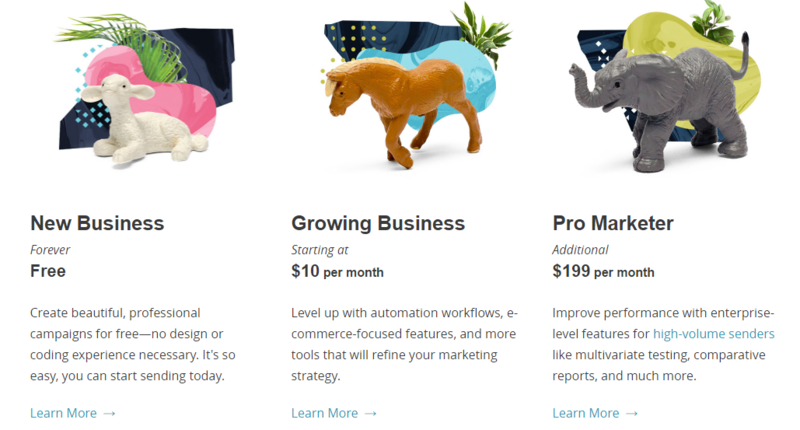 SendinBlue and MailChimp: Which One Is Right for Me? One of the major reasons why you should thoroughly evaluate your email marketing platform is that you’ll likely be using it for at least a few years. At the bare minimum, you should take its cost, ease of use, feature set, and customer support into account before making a final decision. 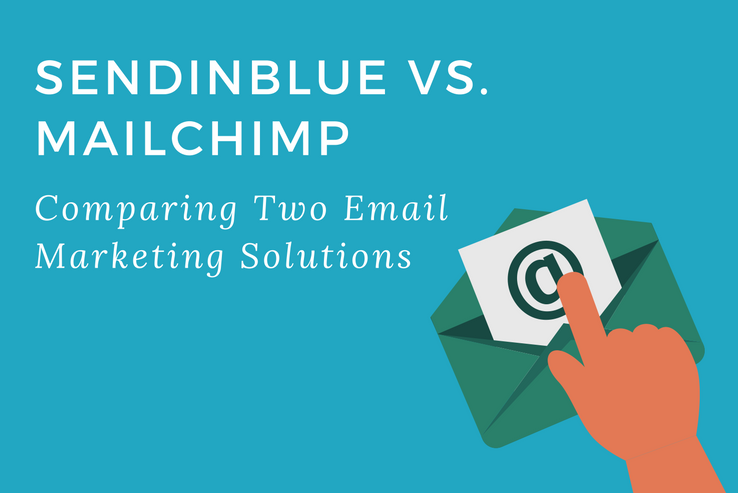 So, between SendinBlue and MailChimp, which one is right for you? Let’s step through each metric one at a time. This is the first (and often most important) criterion for deciding which platform you should go with. If you are a company that does not send emails in bulk, then you might not want to opt for an email marketing provider that’ll be heavy on your wallet. In such cases, it might be more ideal to pay per message or pay per subscriber – based on your requirements. Simply put, both these platforms use different methods. SendinBlue charges for the emails sent, whereas MailChimp charges per subscriber. Based on SendinBlue’s pricing model, you are charged for the number of emails you send. You don’t have to pay anything if you are sending less than 9,000 emails a month. However, you don’t get access to the advanced features with the free version. If you are sending around 10,000 messages per month, then a good option is the Micro plan that would cost you $7.37 per month. You can upgrade your account to 100,000 emails per month for $66 per month. MailChimp, on the other hand, charges you per subscriber. They offer a Growing Business model, starting at $10 per month for 500 subscribers that lets you send unlimited emails. As the subscribers increase, so do the monthly charges. Larger corporations can opt for enterprise-grade solutions with the Pro Marketer plan, which will set you back an additional $199 per month. You won’t be charged a penny if you have less than 2,000 subscribers or if you are sending up to 12,000 emails per month. With the free plan, you don’t get access to advanced features. A new interface can take some time getting used to. For this reason, usability is one thing that you would focus on when opting for a marketing platform – especially if you are not technically experienced. 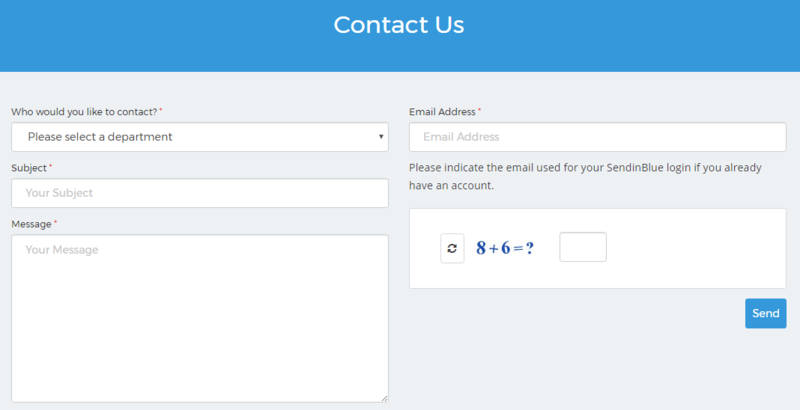 You can use SendinBlue’s email creator, which may not look very pretty but gets the job done. It is functional and enables you to add email lists or build templates using a template builder. In addition to this, you can also choose from a collection of pre-built templates. It’s easy to use for all kinds of online marketers regardless of their technical expertise. MailChimp packs a much glossier interface that you can use with ease. The Template Builder allows you to design custom emails and save custom templates to your library. And the best part is that you don’t have to be a pro at designing to do this. In addition to this, it ships with a variety of templates that you can choose from if you’d rather not create a custom design. With access to advanced features and functionality, you can keep running your email marketing campaigns smoothly. Both platforms offer more or less the same main features and some unique ones. Sending emails with SendinBlue is a cakewalk. All you have to do is navigate to Campaigns, and from there on you are guided through a four-step process. This includes the setup, designing your template, selecting the recipients, and confirmation. SendinBlue features an email designer that lets you use a drag-and-drop builder to create custom campaign designs. You also get access to a campaign reporting and tracking system that gives you insight into how your campaigns are performing and helps you understand them better. In addition to all of this, you can also leverage SendinBlue’s marketing automation, transactional messaging, and integrations functionality to get the most out of your email marketing provider. With MailChimp, you can build your emails with the drag-and-drop feature and decide the placement of the images and text. Once you have created these fundamental blocks of content, you can easily replicate them in other areas of the email. MailChimp offers marketing automation, flexible designing, multi-user accounts, and mobile-optimized functionality to help you manage your email marketing efforts on the go. It’s also got some pretty neat features like delivery by time zone and abandoned cart up its sleeve. MailChimp has an advanced API that allows to offers seamless integration with platforms like WordPress and WooCommerce. With the advanced analytics functionality, you are able to track your customer’s behavior. The detailed reports give you information about subscriber activity, bounced emails, revenue reports, and much more. Good customer support is important to have if you’re going to be using an email marketing provider. It’s always good to know which channels you can use to contact the company’s support staff to get an idea of how fast you’ll get your questions answered. As of this writing, SendinBlue allows users to send in queries through tickets or emails. The website doesn’t have any information on how long they’ll take to get back to you. If you’re stuck with an urgent query, then SendinBlue might not be able to help you out right away. 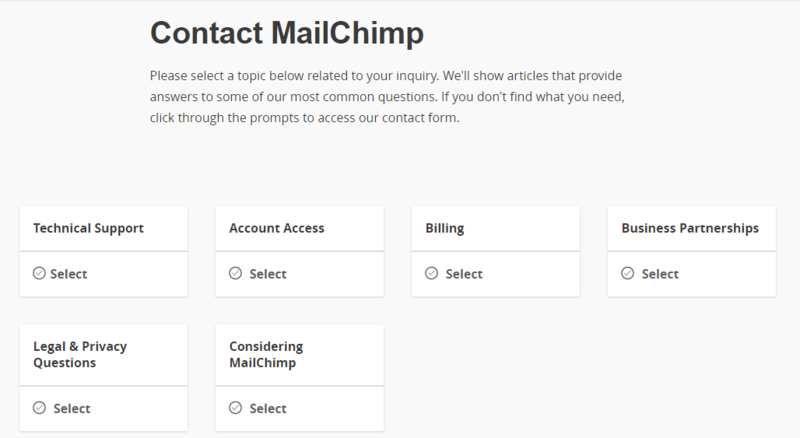 MailChimp’s contact page is divided into different support areas, including technical support, account access, billing, and more. It instructs you to go through their existing articles for more information and detailed answers to frequently asked questions. However, if you’re not able to find what you were looking for, then you can use their contact form to submit a ticket. Both SendinBlue and MailChimp offer some unique features that cater to different marketing needs. For instance, SendinBlue competes on lower prices and MailChimp offers much more integration. If you plan to send thousands of emails every month, then SendinBlue is the best fit for you. Its free plan allows you to send up to 9,000 emails per month. However, if you are trying to understand your subscribers and customers and want to expand your business gradually, then you should opt for MailChimp. Its analytics functionality is incredibly powerful, and you get access to mobile apps to help you manage your marketing efforts on the go. See how MailChimp stacks up against Constant Contact and how it looks compared to aWeber in our other articles in this series! Have you tried out SendinBlue and MailChimp? If so, how was your experience with them? Let us know by commenting below!